Alzheimer’s Disease (AD) is a devastating disease of brain aging that causes progressive, severe memory loss. There is no effective “drug” to prevent or treat AD and we believe that it is unlikely that any will be developed in the near future. Therefore, other therapeutic interventions are desperately needed. To meet this need, NeuroEM Therapeutics has developed a first-in-class, self-contained head device (the MemorEM 1000) to prevent and treat AD with electromagnetic waves – a therapy that we have pioneered and tested successfully in AD animal studies with no adverse events seen in the animals. Our novel, proprietary technology appears to directly affect the AD process to prevent and reverse memory loss. 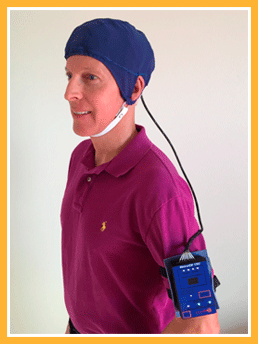 The MemorEM 1000 head device has been successfully used in NeuroEM’s recently completed Phase I clinical trial that evaluated the safety and efficacy of Transcranial Electromagnetic Treatment (TEMT) in Alzheimer’s patients. TEMT is an investigational device currently under development and not commercially available.